America's automotive industry played a definitive role both right before and during America's engagement in the First World War. It produced military vehicles and materiel in sufficient quantities to help the U.S. successfully prosecute the War to end all wars. Even before America declared war in April 1917, its car manufacturers were helping with military production, foreign as well as domestic. Manufacturers were looking for new markets and were more than willing to provide their expertise as war raged. They designed and developed new products, re-tooling plants to produce military equipment. And their American ingenuity and mass production techniques were vastly better suited to war production than the vintage, hand-crafted methods still in use in Europe at the start of the war. American manufacturers scored solid government contracts but also continued to promote civilian sales, encouraging buyers to support the war effort by saving resources and contributing to established war-support programs. On the brink of war, America's military still relied heavily on horse power, i.e., riding stock — but that was about to change. A border skirmish with Mexico had already convinced military planners of the value of mechanized vehicles. Those planners kept a watchful eye on the European war, too, seeing that U.S. auto manufacturers were contributing vehicles there even before America decided to enter the fray. While General John J. Pershing was a fine horseman often pictured astride his steed, he nonetheless appreciated the worth of a mechanized force. In the spring of 1916, during the Mexican Border War, he had first used cars, motorcycles, and even airplanes in a combat situation. In retaliation for Pancho Villa's attack on Columbus, New Mexico, some 4800 U.S. troops crossed into Mexico to search for and capture Villa. Although U.S. troops engaged his rebel forces in several battles, Villa himself was never captured. The U.S. Government had not planned for the expedition that would involve more than 700 horses and nearly 150 mules requiring six tons of hay and 9000 pounds of grain as daily feed. Officers went out in a car every morning to find and purchase corn and hay from local farmers. The army needed to transport supplies and equipment and had yet to establish a mechanized division. 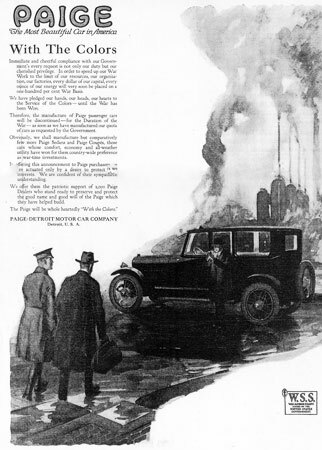 So the Quartermaster General started ordering — 147 mostly front-wheel drive trucks (since the rear-wheel drive trucks tended to bog down in dry sand) from seventeen truck companies (including Locomobile, Peerless, Reo, Packard, White, Kelly-Springfield, Velie, and King) at a cost of $3.5 million. Some of the trucks were even fitted with wheels that could run on roads or railroad tracks. An order for 27 trucks went out to Packard, for instance, and within 24 hours the trucks had been sent via special train, a chauffeur and mechanic included for each truck. It was still too early for the common foot soldier to have knowledge of how to operate a vehicle. General Pershing was an early adopter of using armored vehicles in combat, launching a new lumbering giant of a truck. That was the Jeffery Quad, a heavy four-wheel drive truck armored by Bethlehem steel plates. It could reach a maximum of 20 mph, at 5 miles to the gallon. Cars were needed to carry staff into the Mexican countryside and they were made available, as well. While Cadillac, Reo, and Ford all participated, it was Dodge Brothers who supplied open-top, armored touring cars for the General and his immediate staff. Motorcycles were in evidence, too, with Harley-Davidson providing several dozen specially-built (with sidecar gun carriages) bikes. 1915 armored Harley Davidson motorcycle. Added to the mix were eight bi-planes making up the 1st Aero Squadron, the planes utilized chiefly to get messages from field headquarters to units in the field. For all these mechanized vehicles, however, gasoline still had to come in on pack mules. The chase went on for nine months, after which President Wilson called the soldiers home to prepare for action against Germany. Pershing left the dusty Mexican landscape behind, saying, "Villa is everywhere and Villa is nowhere." Just as the Mexican Border War had introduced mechanized vehicles to combat, WWI marked the first time motorized ambulances were used to transport the wounded from the front lines to field and civilian hospitals. At the start of the war, in fact, the French still moved some of the wounded in horse-drawn carts. In September 1914, the English Royal Automobile Club offered their cars and drivers to the British Red Cross, which soon thereafter was buying up all the vehicles they could find for this purpose. 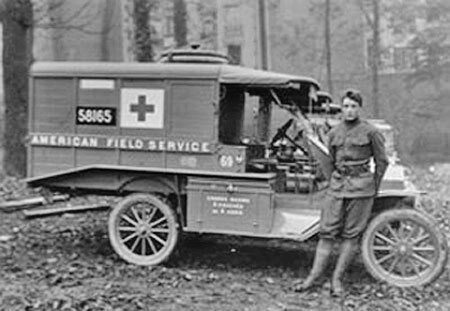 Also that year American archaeologist Richard Norton, backed by French millionaire banker Henry Herman Harjes, part of the American colony in Paris and a representative of the American Red Cross, started the volunteer Norton-Harjes Ambulance Corps. The first volunteer ambulance corps to operate in France, it ran many makes of cars from Fords, Dodges, and Studebakers to Cadillacs and Packards — and recruited drivers from American colleges. In fact, when Norton first asked to operate under the protection of the British Red Cross, there was resistance because most of his cars were American-made rather than British-made. Once that objection was overcome, however, the corps could operate under authority of a nation already engaged in the conflict. The following year another American launched an ambulance service, as well, initially to bring the wounded to the American Hospital in Paris. A. Piatt Andrew, an economics professor at Harvard who had gone on to become an Assistant Secretary at the Treasury Department, started the American Field Service (AFS) providing ambulances and volunteer drivers to the French Army. Standardizing on a light ambulance based on the Ford Model T, the four-cylinder, hand-cranked cars were shipped in wooden crates, with only frame, wheels, motor and transmission assembled. On site, the crates were used to make the body of the ambulance which was painted a slate blue and fitted with large, non-skid rear tires. While one of the early volunteers complained that well-known pacifist Henry Ford charged full retail prices for the cars and their replacement parts, AFS nonetheless initially imported about 1200 Ford cars to be converted to canvas-topped ambulances and another 200 to serve as staff cars, run-around trucks, etc. The real advantage to the Model T was that it was lightweight — so if it got stuck on the rutted battlefield, soldiers could lift it out of the mire and send it on its way. The AFS corps was well organized with its own repair park, training camp (since many volunteers had never driven a car), recruiting station, and fund raising arm. Both these ambulance units were attached to French combat units at first and, later, to other fronts. 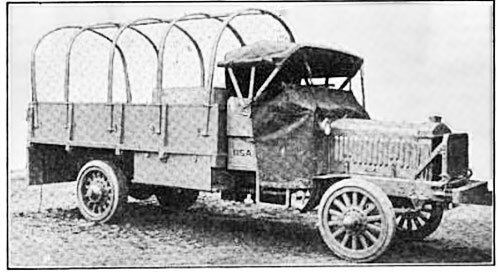 When the U.S. American Expeditionary Forces arrived on the battle scene, however, all ambulance vehicles were turned over to them. 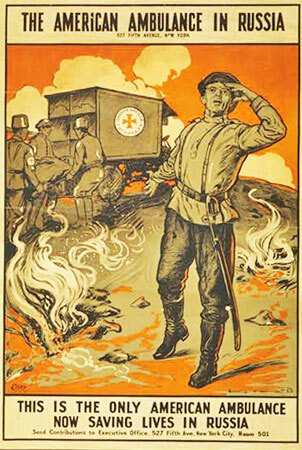 Poster depicting American ambulances in Russia. Great numbers of American volunteers were already helping with the wounded. American makers like Cadillac, Dodge, Ford, and Packard were providing cars and White, Mack, FWD, and others were sending trucks to English, French, and Canadian forces. But it was only in the spring of 1917 that America entered the war. A few months later, manufacturers were offering to utilize their facilities for war work. Although their offer was patriotic, they were also responding to a real threat to their business. The War Industries Board (WIB) was established in July, 1917, as an agency to coordinate procurement of supplies needed for war, set production quotas, and allocate raw materials (for the car industry, primarily coal, rubber, and steel). Just a month later, on August 6, 1917, the National Automobile Chamber of Commerce met in Detroit and voluntarily agreed to cut production of passenger cars by 50%, beginning August 1, 1918. They conveyed their position to the WIB by letter of August 8, volunteering their hearty support to the automobile industries committee in Washington and pledging full cooperation with the WIB, the Army and the Navy. Since the WIB needed steel to build ships and skilled auto workers to manufacture planes, ordinance, and other war materials, however, they responded instead that car maker should discontinue the manufacture of all passenger cars by January 1, 1919 and put their total output on a war basis. The WIB letter explained that the industry could not count on more allocations of steel and that makers must report all on-hand steel supplies so a decision could be made as to whether those would be taken away, as well. The most aggrieved portion of the industry was car dealerships. Dealers sent telegrams to the WIB asking for a hearing, and the hearing was set for August 16. A chorus of voices in support of the industry arose. Alfred Reeves, General Manager of the National Automobile Chamber of Commerce, said it was difficult to draw the line between strictly business need and the pleasure use of cars. Besides, even President Wilson himself enjoyed a relaxing automobile ride each afternoon. While pleasurable, that relaxation certainly was important for business purposes. John N. Willys, President of the Willys-Overland Co., embellished those arguments, explaining that the car rivaled the telephone and telegraph as one of the country's greatest utilities. He added that in 1917, farmers bought more than 50% of cars as a labor-savings device, i.e., cars and trucks helped farmers raise more wheat with fewer men, market it, and buy more government bonds with the proceeds. Likewise, a car could save businessmen at least an hour a day, getting them to their appointments more efficiently. Samuel Colt, President of US Rubber Co., urged that nearly everything on wheels be used for the war effort, though he spoke of a broad context since he reckoned that no more than 10% of cars were used strictly for pleasure. After a number of meetings with industry representatives, the WIB agreed to the original offer of a 50 % reduction in passenger car production. (Note: during WWI "pleasure" cars were anathema, so they were called "passenger" cars instead.) The 230 passenger car makers and 372 makers of motor trucks could breathe again. Still unknown is whether the WIB's decision as to passenger cars was influenced by ads of the day announcing pleasure cars or whether it was simply an opening negotiating strategy. Even after the WIB decided not to nationalize the auto industry, significant challenges remained. Manufacturers and related automotive businesses faced labor shortages since males between the ages of 18 and 45 were subject to the draft. All new employees, of course, had to undergo extensive training for their specific tasks. Exports fell significantly, as well, from $97.5 million in 1916 to $90.9 million in 1917, due primarily to import prohibitions and the lack of civilian shipping facilities. With fewer new cars heading for the roads, the industry began to work to understand the used car market better, acknowledging that used cars needed to be shiny and bright if they were to sell. Buyers began to see the value in converting cars to commercial vehicles, too, especially since most trucks were manufactured for the war effort. On October 3, 1917, President Wilson signed the War Revenue Bill that imposed a tax on all vehicles, to be paid monthly by manufacturers, producers, and importers. The tax was set at 3% of gross sales, with a deduction of 5% of the amount paid for tires. While some of these challenges proved too much for producers, many other automotive manufacturers found a way to support the war effort, continue civilian sales, and ensure continuing viability. Even as the WIB was overseeing the availability of raw materials to the automotive industry, the Armed Forces called on experts in the automotive field to go beyond their normal activities. Besides supplying staff cars, armored vehicles, and supply trucks, they were asked to automate gun production, design aircraft engines, build boats, etc.--and the industry answered those calls. Extensive battlefield testing had shown a shipped animal needed at least a month to get back into working condition whereas a mechanized vehicle was ready to go when it arrived. Car manufacturers found new military markets. 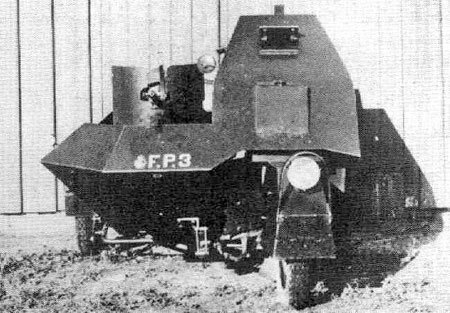 Ford, for instance, was a mainstay throughout the war. Even at the start of WWI the French were already using Model Ts, some already in-country, others assembled by a Paris-based agency from American-made parts. And, as mentioned earlier, Fords also played a vital role in the ambulance corps rescuing French soldiers from the front. But all makers were supplying cars and trucks to America and its allies — and they weren't shy about utilizing popular advertising to announce their involvement. They were in for the long haul, supporting the U.S. war effort in many ways. The Elgin Six, for example, was advertised as a car in the service of the U.S. War Department, referencing a letter from Secretary of War Newton D. Baker appointing the Elgin an Official Scout Car to report transcontinental road condition and to gather information of great value in determining emergency movement of troops and supplies. This was seen as a "commission of honor" for never had a car been sent on an errand so important to the Government. 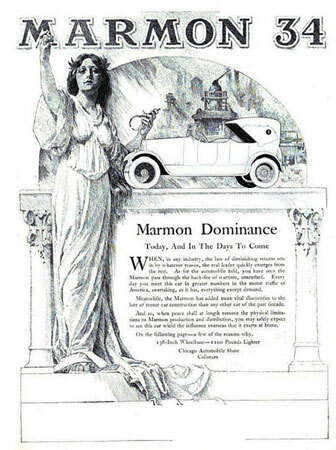 The Marmon 34 "Marmon Dominance" ad depicted the Marmon 34 as a car that had passed "through the back-fires of wartime, unscathed." The Paige held itself out as privileged to stand "with the colors." 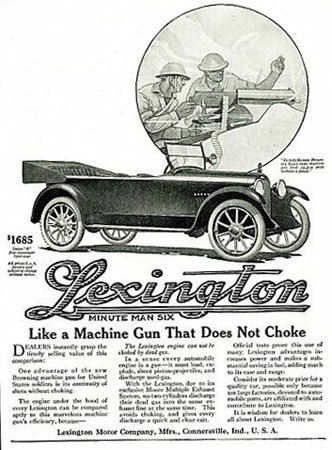 And the Lexington Minute Man Six was advertised as being like the Browning machine gun that does not choke. 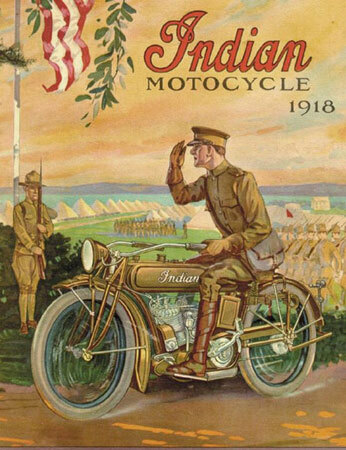 A classic color ad for Indian motorcycles reflected the fact that a majority of its 1917 and 1918 Powerplus bikes, more than 40,000, were sold to the U.S. Government. 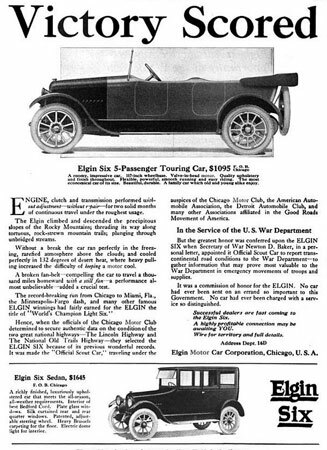 Elgin Six ad announcing the Elgin Six as being appointed the Official Scout Car by the War Department. Paige "With the Colors" ad. Lexington Minute Man Six ad. When, in April 1917, the former French chief commander Marshal Joseph Joffre asked Secretary of War Newton D. Baker for assistance in making the finely-machined recoil firing mechanisms for the French workhorse 75 and 155 cannons, Baker contacted John Dodge. While the French were producing only five guns a day, Dodge said if he had accurate blueprints and was allowed to manage the project as he saw fit, he could turn out any number of guns required. When Joffre and Baker doubted that the job could be done, Dodge asked, "Do you want us to do this job, or don't you?" They decided they did, and Dodge churned out thirty a day, by war's end earning a Legion of Honor medal for himself and his staff. The U.S. needed a powerful pursuit plane. Again the automotive industry delivered, with the 12-cylinder Liberty engine which produced 400 hp when European-made engines produced about 200 hp. In less than a week in May 1917, working at the Willard Hotel in Washington, D.C., aviation engineer Elbert J. Hall of Hall-Scott and Vice President of Engineering at Packard, J.G. Vincent redesigned an experimental 8-cylinder engine Packard had built. Less than six weeks later Packard had a hand-built prototype but General Pershing put that on hold, preferring instead a 12-cylinder engine first tested in August 1918. Using off-the-shelf components whenever possible, five builders — Lincoln, Packard, Ford, Nordyke-Marmon, and GM's Buick and Cadillac Divisions — produced nearly 18,000 Liberty engines before war's end, nearly 6,000 of which were sent to Europe. 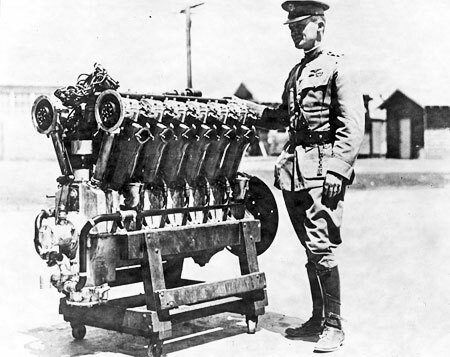 While only 196 Liberty-engine DH4 planes were assigned to combat in WWI and while the engines had their problems, the U.S. Air Service used the stronger, lighter, overhead camshaft engine for another ten years. Buick Terrorizes the Kaiser with Liberty Engine. A 1917 Washington Post editorial called for a submarine chaser, "an eagle to scour the seas and pounce upon and destroy every German submarine." 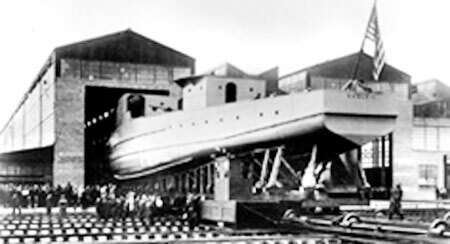 In December 1917, Henry Ford told the Secretary of the Navy that he could build these 200-foot Eagle boats using mass-production techniques and that he would not require skilled shipyard labor already engaged in conventional shipbuilding. Soon thereafter, Ford had a contract to build a hundred such patrol boats. He completed a new plant at River Rouge in five months and, in July 1918, the first Eagle Boat entered the water. Ford had already discovered, though, that ship building was a little tougher than he'd thought. The boats were too large for his traditional moving assembly line so they were moved instead on tractor-drawn flatcars. The boats had quality control issues, too — poor riveting, awkward handling, oil leaks, and hulls that let in water. Only sixty of them were produced before war's end and none ever saw action in WWI. It was fortunate that Ford's other wartime products — Model T cars, trucks, tractors, tanks, ambulances, helmets, etc. — worked so well. 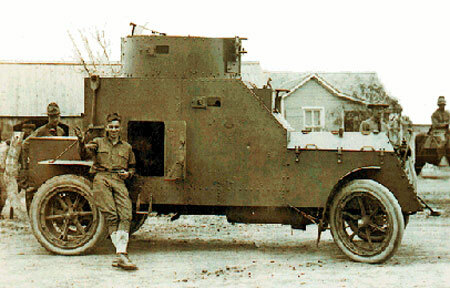 The industry also produced other specialized vehicles — the King armored car, tested by the Marine Corps but never accorded much attention; the Holt Gas-Electric truck, the first U.S. tank but one which underperformed, topping out at 6 mph; and, under license from Renault, the M 1917 6-ton light tank, ten of which made it to Europe but none of which entered combat. Because America entered the war relatively late, the industry did not have time to develop these early ideas sufficiently. Still, the automotive industry had demonstrated its willingness and ability to aid the nation in time of war. As eager as automotive makers were to enter new fields, it was in trucks that they arguably made the biggest impact. Trucks could travel further and carry more than cars. As automotive producers graduated from commercial cars built on regular car chassis to larger trucks specifically designed for hauling, customers at home and abroad found more and more uses for them. Trucks came in all sizes, shapes, and descriptions and moved produce to market and materials to ports for onward shipment. Because items moved more quickly and efficiently, farmers could produce more and manufacturers could ship more to new markets. Despite the urgent need during wartime to move supplies and equipment, this was still a day in which horse-drawn conveyances were often used to move freight to railheads and there were too few train cars to handle the war surge. Because the railroad system was so antiquated, in fact, and could not keep up with demand, in late 1917 it was nationalized for the duration of the war. Trucks were used to bridge the gap presented when trains failed to meet the challenges of war. And on the front, after train rails had been bombarded and rail service rendered inoperable, trucks were rugged enough to traverse rough terrain. Experience with the Mexican Border War had taught the military that having many different makes and models of trucks meant major headaches when it came to repair and replacement parts. Needing to standardize equipment, they summoned a number of automotive engineers to Washington to design a Class B Liberty truck with standard, interchangeable parts, rated at 6000 pound load capacity. Once the design was completed, the Motor Transport Section of the Office of the Quartermaster General issued specifications, drawings, and parts lists. Many manufacturers — among them, Bethlehem, Brockway, Diamond T, FWD, Garford, Gramm-Bernstein, Indiana, Kelly-Springfield, Packard, Pierce-Arrow, Republic, Selden, Service, Sterling, U.S. Motor Truck Co., Velie, and others — produced the trucks, all of which had "USA" on their radiator tanks. In October 1918, the first of these trucks reached France, and by war's end more than 8000 had reached that destination. The rugged trucks, utilizing available parts and easy to maintain, buttressed the entire war effort. 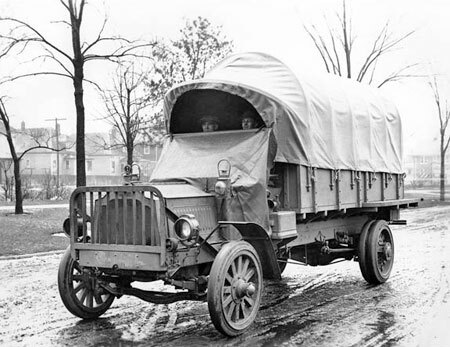 Truck manufacturers in 1918 had produced ten times the number of trucks they'd produced in 1912. In field testing prior to the war, the U.S. Army pitted trucks against mule trains. Trucks won out. Then, in June 1917, another test was held: trucks vs. trains. More than seven hundred truck drivers were asked to keep efficiency records on fuel consumption, needed repairs, etc., eventually demonstrating conclusively that businesses could net savings by choosing trucks over trains. 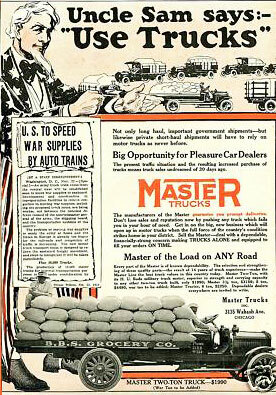 Some truck manufacturers began advertising truck trains and their ability to meet the demand when trains alone could not. Others advertised how both cars and trucks could conserve labor and support the war effort. Uncle Sam Says to Use Trucks. 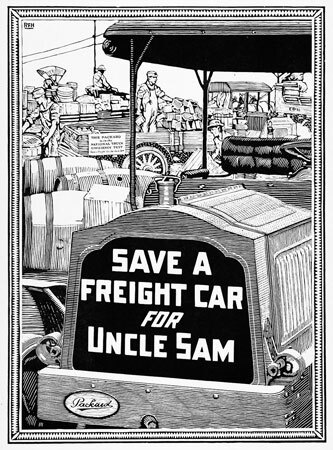 Save a freight car for Uncle Sam ad. A sign in the background reads, "This Packard is in the National Truck Efficiency Test. Packard, in cooperation with the National Council of Defense and the WIB and in order to save freight cars for urgent government service, announced on June 1, 1917 a National Truck Efficiency Test." Eventually 760 trucks involved; prizes totaled more than $5000 to get owners and drivers to keep efficiency records based on load, state of roads, time for route, use of fuel, tires, etc., maintenance costs; test "proved" businesses could net great savings by using trucks. Cars and trucks proved useful in promoting the war effort at home as well as at the front. The government wanted to promote civilian patriotism and raise money for the war effort. There were many ways of doing so, starting with the sale of Liberty war bonds and war savings stamps (a program primarily for school children) and going on to champion conservation of all materials. While there was no rationing, citizens were encouraged to eat more grains and less meat, sugar and fats. Individuals, companies, and the government collaborated in finding new ways to encourage support for the war. Cars and trucks played their part. 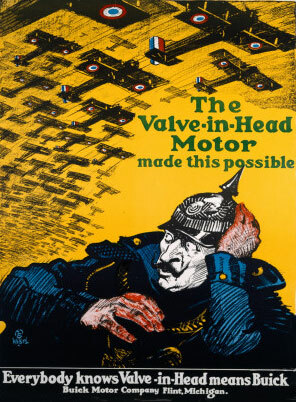 Underscoring their use in patriotic campaigns, automotive companies began using their advertisements to promote war-support efforts on the home front. United States Food Administration ad showing appreciation for trucks. 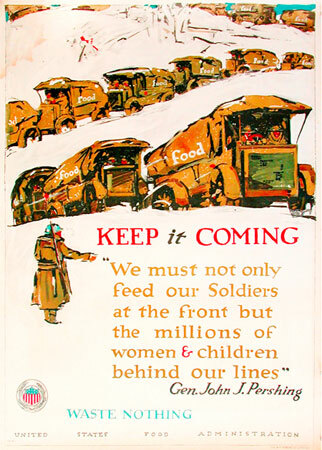 The U.S. not only fed its civilians and soldiers but also shipped food to Allied soldiers. Economy was the watch word at home with families encouraged to have only those things they could not do without. For those things, they were told, they should buy quality, long-lasting products. Savings could be used to lend money to the U.S. Government for the war effort. Motor vehicle advertisers made their pitch to conservation-minded civilians, too. Car Manufacturers were in the business of meeting a need and finding new markets for their products. They could not, of course, control how those products would be used and may, in fact, have been amused when a New York City car dealer's pre-war inspiration led to an advertising campaign for near beer. Dealer Conover T. Silver, just prior to America's entry into the war, conceived and had built a kind of land boat, a nautical-themed body on an Overland chassis. The "Silver Bird" hull was built of alternating stripes of mahogany and white holly while the deck was fitted out in birds-eye maple. A ship's bell was mounted on the radiator and a nickel propeller covered the spare tire. Word spread about this novel hybrid vehicle that appeared in the 1916 film "Gloria's Romance". Anheuser-Busch bought the car-boat thereafter, renaming it the Bevo (for their non-alcoholic malt beverage of the same name — from pivo, the Czech word for beer). The near-beer was developed just before a 1916 ban on U.S. military forces consuming alcohol — about four years before national prohibition would come into effect. 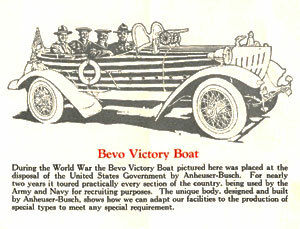 The near-beer proved popular, and Anheuser-Busch sent its original Bevo Victory Boat and a second look-alike built by their Vehicle Department (this time using a Pierce-Arrow chassis) to help sell War bonds. When America entered the war the car-boats were lent to the U.S. Government for recruiting purposes. A Dort car ad appeared in the January 15, 1918 edition of The Saturday Evening Post heralding this message: "Thou shalt not waste! It is the modern commandment born of the great world-wide struggle to preserve liberty and perpetuate democracy. . . . Both military and civic competency demand such [an economic] car. It serves best the soldier, the professional man, the salesman, the farmer and all those to whom accelerated movement means multiplied success." The National Twelve was pitched as "true war-time economy", its fuel, tire and maintenance costs "surprisingly low." Nash Motors plugged their trucks and cars as "high grade" vehicles "carrying men and material quickly and at low cost — conserving labor, time and energy." Moon cars were noted "for the kind of conservation that means saving without a single sacrifice." Many other car manufacturers joined in the litany of conservation virtues, as well. 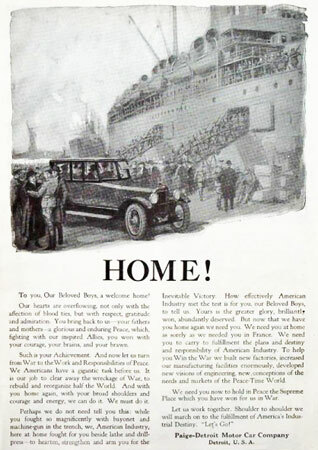 At war's end auto manufacturers joined in a warm welcome to returning troops — and the jubilance grew as 1919 ushered in the greatest business the relatively new auto industry had ever known. Armistice came on November 11, 1918, and on November 15, the American Expeditionary Forces sent a telegram to car companies advising them to stop war production and convert back to civilian production. Some manufacturers had already failed due to wartime material shortages but those still afloat had managed to corner gas supplies and recycle rubber and metal. They were eager to return to civilian sales. 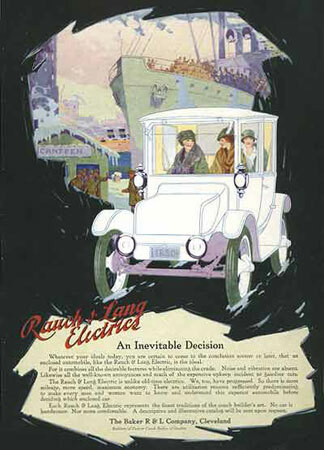 Rauch and Lang electric ad — stylish women welcoming soldiers home from war"
Paige Motor Car Ad welcoming troops home." "To you, our Beloved Boys, a welcome home! Our hearts are overflowing, not only with the affection of blood ties, but with respect, gratitude, and admiration. You bring back to us — your fathers and mothers — a glorious and enduring Peace, which, fighting with our inspired Allies, you won with your courage, your brains, and your brawn. Such is your Achievement. And now let us turn from War to the Work and Responsibility of Peace. We Americans have a gigantic task before us. It is our job to clear away the wreckage of War, to rebuild and reorganize half the World. And with you home again, with your broad shoulders and courage and energy, we can do it. We must do it. Perhaps we do not need to tell you this: while you fought so magnificently with bayonet and machine-gun in the trench, we, American Industry, here at home fought with you beside lathe and drill-press — to hearten, strengthen and arm you for the Inevitable victory. How effectively American Industry met the test is for you, our Beloved Boys, to tell us. Yours is the greater glory, brilliantly won, abundantly deserved. But now that we have you home we need you. We need you at home as sorely as we needed you in France. We need you to carry to fulfillment the plans and destiny and responsibility of American Industry. To help you win the War we built new factories, increased our manufacturing facilities enormously, developed new visions of engineering, new conceptions of the needs and markets of the Peace-time World. We need you to hold in Peace the Supreme Place which you have won for us in war. Let us work together. Shoulder to shoulder we will march on to the fulfillment of America's Industrial Destiny. "Let's Go!" Since there was no time to introduce new models, manufacturers sold the same models for 1917, 1918, and 1919. Although no automobile shows had been scheduled for 1919, manufacturers and show committees hustled to produce shows in 1919 that proved immensely popular. The boom times that marked the roaring twenties were underway, powered in part by women who had worked in industry during war time and who had learned to drive and maintain cars. They no longer depended upon a chauffeur or other male companion to get them where they needed to go. 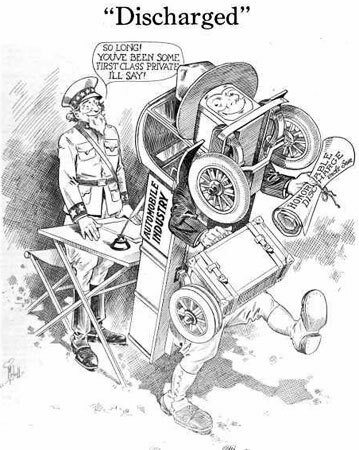 Uncle Sam "Discharging" the US Auto Industry. The Great War moved the world on to new weapons and tactics, proving the value of a mechanized force in waging conflicts. General Pershing, such a commanding presence atop a steed, was also viewed in staff and parade cars built by Dodge, Cadillac, Locomobile, and others. More than 40,000 Model T's were put to use in the war effort — and that despite Henry Ford's pacifist stand. Cars, once seen as luxuries, were widely accepted as useful and economical transportation. The automotive industry, inclusive of automotive suppliers, showed its commitment to supporting the national struggle, applying armor plate and heavy guns to vehicles designed only for the civilian market and devising specialized boats, trucks, engines, etc. when called upon to do so. Using mass production techniques, producers rolled products out quickly, by war's end shipping more than 100,000 vehicles to the front. Never again would war depend solely upon cavalry and infantry. The link between industry, particularly the automotive industry, and the military had been firmly established.